Posted on February 22, 2013	by Katy K.
This is the book that I loved so much that I begged my love to buy it for me as soon as I’d finished my library copy, because I was disappointed every time what I was reading wasn’t it, and there holds on all the library copies. For the record, the last book I had to turn around and re-read was Ready Player One, and I went out and bought The Night Circus right after finishing it so I could lend it out to friends. 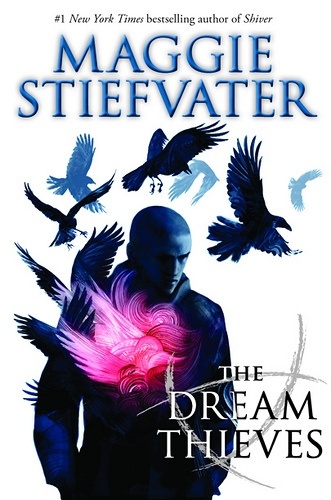 Sixteen-year-old Blue Sargent has grown up the only non-psychic in a family of psychic women, but with the unique ability to strengthen other people’s psychic powers. The “family” includes an assortment of aunts by blood and friendship, including Blue’s newly-arrived half-aunt Neeve. Every psychic Blue has ever met has told Blue that if she ever kisses her true love, he will die. So Blue has made rules for herself: stay away from boys, because boys are trouble. Even more, stay away from Aglionby Academy boys, because they are even worse. But this year, things start to change. At the Death Watch in a ruined church on St. Mark’s Eve, there just to help Neeve see the spirits of the future dead as they walk by, Blue sees the shadowy spirit of a boy, whom she can tell by the raven on his sweater is an Aglionby boy, and who says his name is Gansey. Soon, they meet in person, and Blue is integrated into the small team of his friends, despite her distrust of his family money, good looks, and charisma. (Go Blue! Way to not be instantly swept off your feet by money with a handsome face!) Instead, she’s drawn to one of Gansey’s other friends, Adam, a quiet boy whose accent in unguarded moments reveals him to be a local (poor) boy, unlike the usual wealthy Raven Boys. The other two boys in the group include the angry, shaved-head Ronan (featured on the cover of the second book) and shy and “smudgy” Noah. They are all bound together by Gansey’s passionate quest to find the ley line he believes runs through Henrietta, which he believes will lead him to the sleeping Welsh king Glendower. There are all sorts of mystical elements in this book: ley lines, magic rituals, tarot cards, trees that speak Latin, old cars (ok, those are less mystical for me), which apparently confused the New York Times reviewer and delighted me. But there’s also a whole lot of real truth, as well, in the power of love in Blue’s family and the sturdy bonds of friendship, forged quickly in the intensity of their quest. All of the major characters – with the notable and clearly purposeful exception of Neeve – have clearly relatable back-stories and non-magical issues. I couldn’t help loving both Adam and Gansey; the brutally honest Ronan, as my love says, we respect without liking. I loved the male friendships, the late nights helping a friend in trouble as often or more as the late nights over gelato or pizza. While this is only the beginning of the story, and Blue is still very tentative about any romance, the love triangle of Blue and Adam or Gansey is clear from the very beginning, and it’s the best love triangle I’ve read in a very long time. It’s not angsty or forced, but just a group of friends with excellent potential, either one of whom could be very good with Blue. The New York Times reviewer also took issue with the lack of diversity, which I get, but I also feel that more diversity would either have felt forced – how many old money African-American families from Virginia do you know of? And it would have been worse to have Adam come from a Black trailer trash family, I think. Blue could very plausibly be ethnic Romany without it being explicitly said – she’s described as being short with dark hair and not much more – and Noah, whose car Gansey describes as having new money bling, could potentially also be written as any ethnicity. But, though I do care deeply about diversity in general, and enjoy reading books with ethnic diversity, this did not bother me at all. Will Patton, the narrator, has a gravelly Southern voice which at first struck me as odd, considering that our first-introduced character is a teen girl. However, he proved himself excellently versatile, giving convincing voices to the wide array of male and femal e characters spanning a range of ages in the story. I’m far from an expert in Virginia accents, but people were described as having a variety of them in the book, and they were there to hear. That is one of my favorite aspects of audio books, as I’m liable to think any character in my own accent unless I concentrate on it or it’s mentioned – hearing the individual voices makes the characters come that much more alive. This audio book also includes Maggie Stiefvater’s original theme music for the book, played at the beginning and end, and performed by herself and her friends. It is haunting and atmospheric and makes me wish I could get a whole soundtrack for the book to listen to. All together, I thoroughly enjoyed this book and am anxiously waiting for book two, The Dream Thieves, due out in September. This entry was posted in Books and tagged modern fantasy, teen fantasy. Bookmark the permalink. I did very much enjoy this one too—so many characters to care about! I remember you liked it! I would have linked to your post if I hadn’t had to leave right then. I keep mulling over in my mind if you really wouldn’t like the Wolves of Mercy Falls series. I loved them a lot (maybe not quite so much), but you’re not as into romance, but on the other hand again, it’s not the irrational swoony romance of some other teen romances. And the werewolves are used as a metaphor for retaining your self in pack-mentality places like high school, which I found more interesting than, say, sparkly vampires.